The remains of 10 stone grave markers were found, one of which is displayed here. It is limestone and was found reused elsewhere. 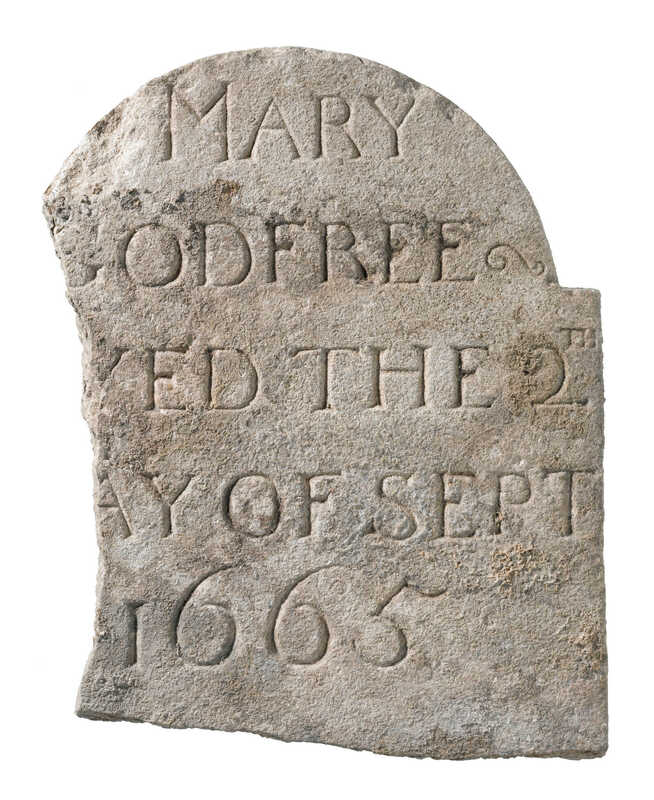 Originally it marked the burial place of Mary Godfree, who died on 2 September 1665, a victim of the Great Plague. An entry for her death was found in the burial register of St Giles Cripplegate, but she was interred in the New Churchyard. 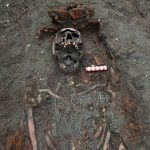 A number of objects were discovered that had been deliberately placed in burials. 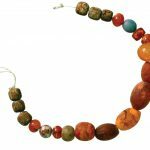 The 20 amber, carnelian, glass and bone beads (on a modern string) were found with the skeleton of an infant. The London delftware plate depicts a well-known design, ‘Chinaman among grasses’ and dates to 1670-90. It had been placed in the coffin, face down, over the stomach area of a woman. 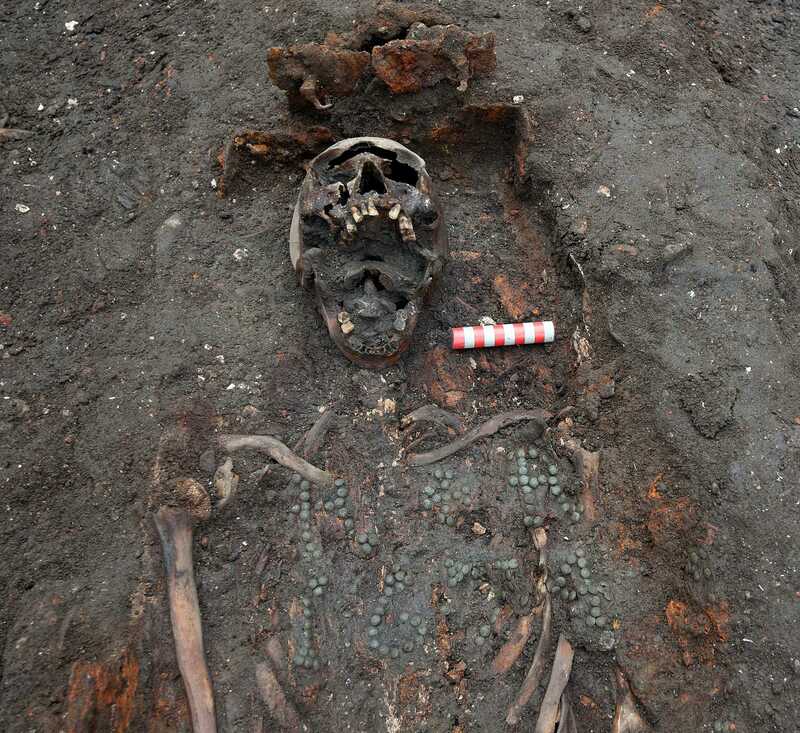 In some cases parts of the wooden coffins, iron coffin handles or decorative studs survived. 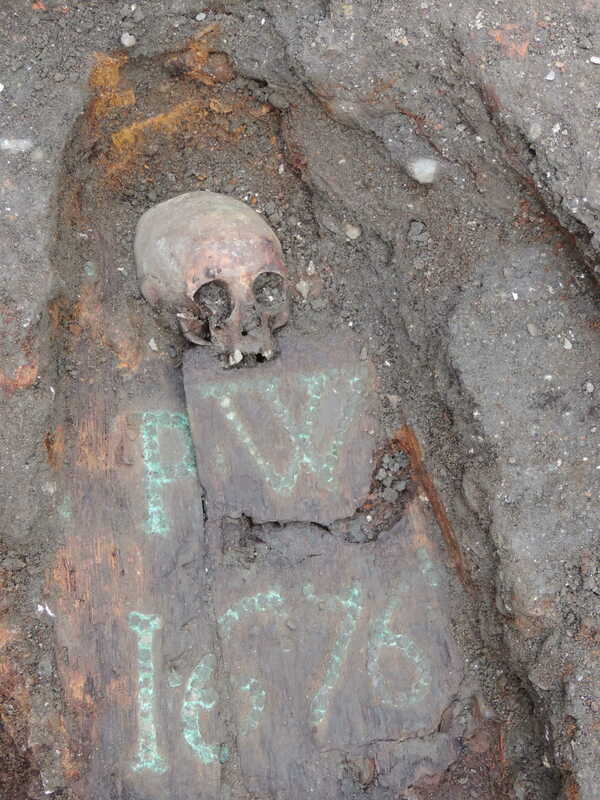 From the late 17th to mid-18th century coffin lids decorated with metal studs were popular. 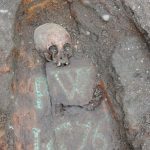 Eleven were found with biographical details, usually initials and the date of death. This example  has the initials PW and the year 1676 set out in copper-alloy studs. 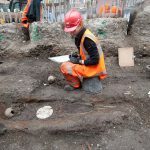 Ten stone grave markers were found at the site. 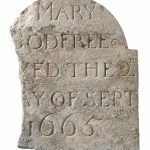 This one is for Mary Godfree, who died on 2 September 1665, a victim of the Great Plague. From the late 17th to mid-18th century decorated coffin lids were popular. 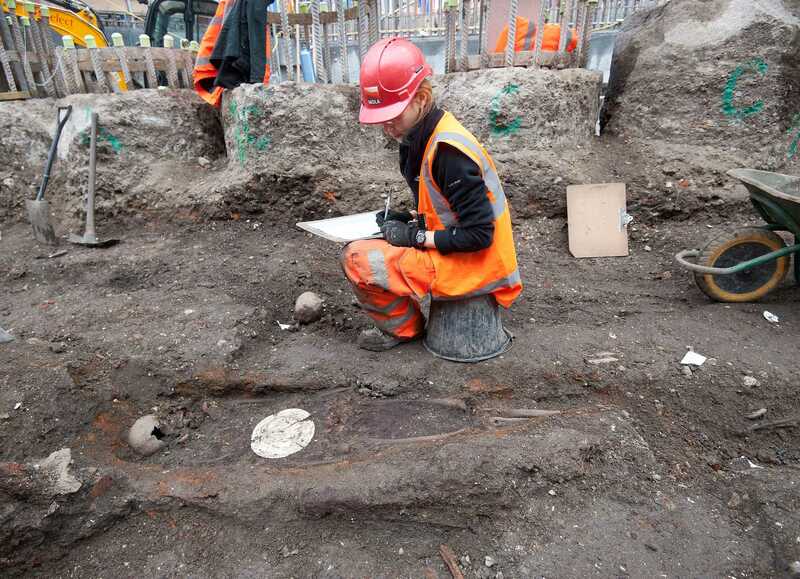 This one, the earliest that was uncovered by Crossrail at Liverpool Street, shows the biographical details of the individual: 'RR 1674'. Eleven were found with biographical details (usually initials and date of death). This example reads ‘PW 1676’. 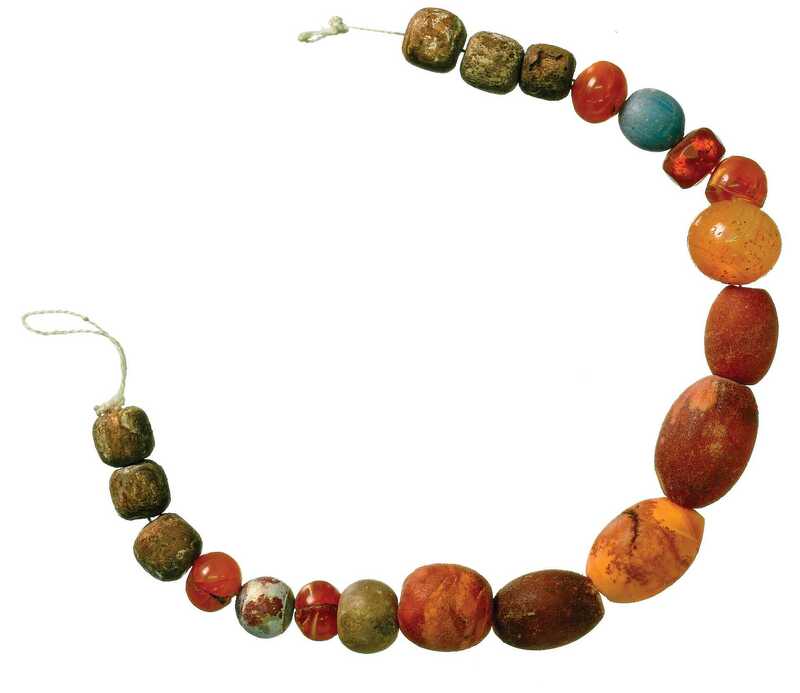 The beads, shown here on a modern string, were found scattered around the neck of a one year old child. The beads are amber, white amber, carnelian, glass and bone. 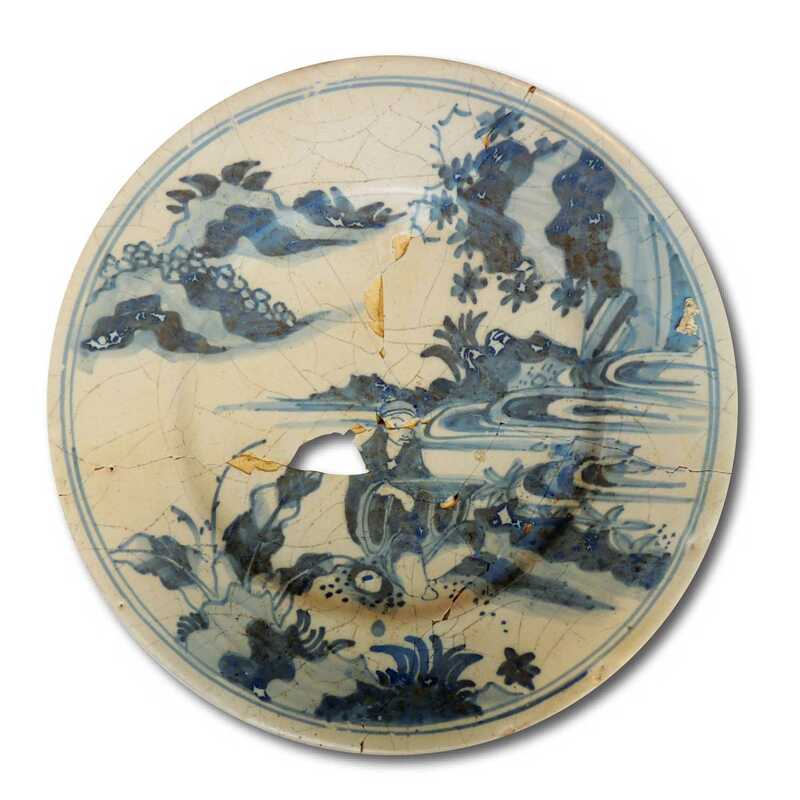 The London-made delftware plate (right) was found face down on the stomach of an adult woman (above). The plate may have contained salt, thought to be both a preservative and a protection against the devil.